Tag clouds are visual depictions of the user-generated terms or words in your references. 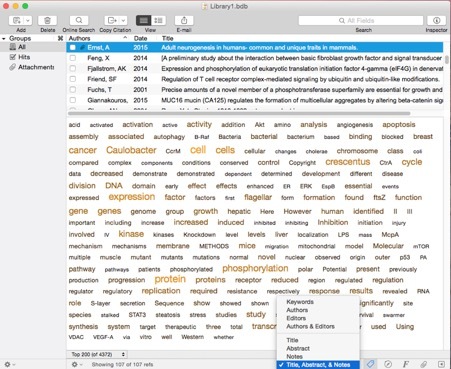 Tags (which can be terms such as names and keywords, or words from titles, abstracts, and/or notes) are displayed alphabetically, with their frequency indicated by text size and color. Hover the pointer over a term to see its frequency, and drill down through your references by selecting tags and restricting the reference list to just the matches. Create your own metatags, which allow you to group tags found in keywords, titles, abstracts, and/or notes under terms of your choosing. Metatags can contain other metatags in a hierarchical relationship, allowing you to find groups of related articles with a click. Tag clouds offer a dynamic bird’s eye view of your references that you’ve never had before.